Register with Boatshed to see 55 extra photos of this Manx Day Boat Complete With Trailer! This delightful day boat , is a Manx Fishing vessel and is traditional in appearance. The construction is of GRP and has been heavily laid up. She has clinker chines and a long keel. The exterior has an original Lugworm Red gel coat and her inside is painted cream. The spars are of pine and the thwarts, rudder and the gunnel strakes are of a tropical hard wood. This boat has built in GRP buoyancy compartments both fore and aft and two under seat lockers. 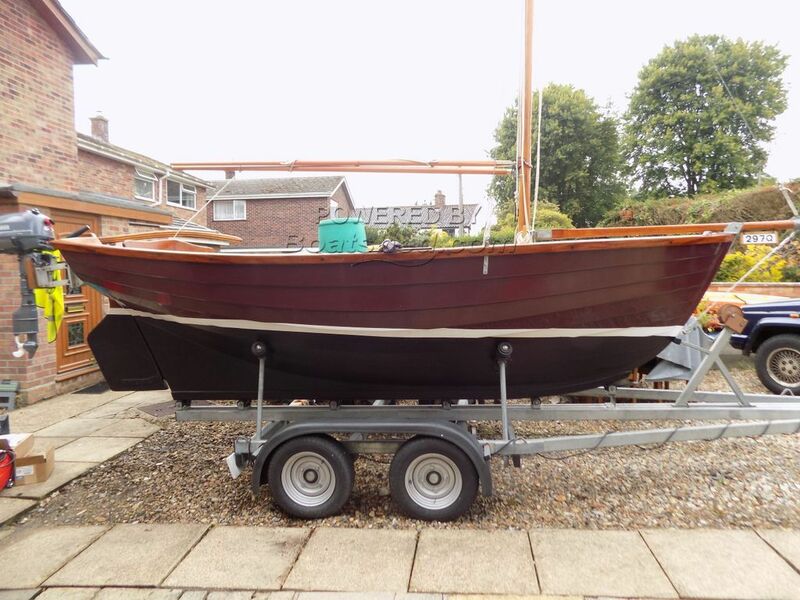 Her sails are matching lugworm red and are in a very good condition. This craft comes with a recent twin axle braked road trailer and new Yamaha outboard (2015) that has never been used. The condition of this boat is exceptional and a credit to the owner. NOW REDUCED!! This Manx Day Boat Complete With Trailer! has been personally photographed and viewed by Geoff Jaquest of Boatshed Norfolk. Click here for contact details.